So apparently I had been "nice" in his books so he decided to see about getting me an upgrade on an ADC device for vinyl recording and measurement accuracy :-). 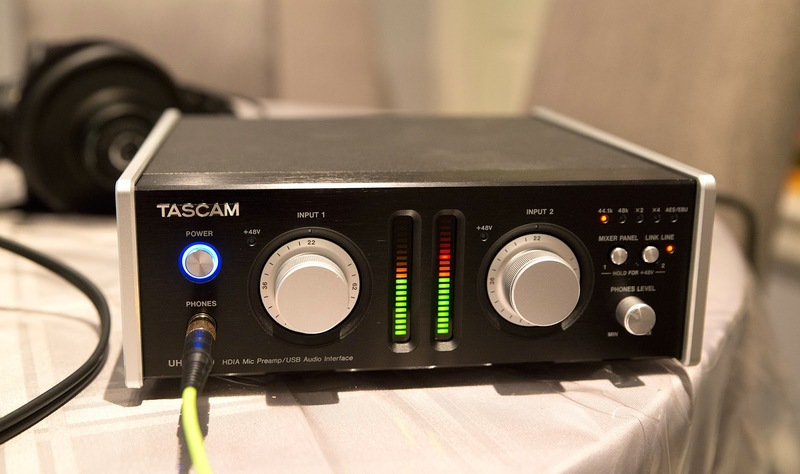 This is the Tascam UH-7000, part of the "pro" line of audio interfaces made by Tascam/Teac. It's a simple 2-channel model. On the front we have 2 large knobs to control the preamp input level for each channel - rotation feels smooth - good enough for reasonably precise volume adjustments. There's the "Phones Level" knob for headphone volume and when the "Link Line" LED is lit, this also serves as a master volume control for the microphone/XLR inputs. Holding down one of the two buttons for a few seconds above the "Phones Level" knob allows you to turn on the +48V mic phantom power. There are the corresponding multicolored 20-segment LED indicators; very useful to check for clipping. To the left are the analogue inputs. This unit is meant for professional audio use so there are no single-ended RCA connectors to be found. Instead to the upper left we have 1/4" TRS balanced inputs, and XLR balanced below for analogue input. 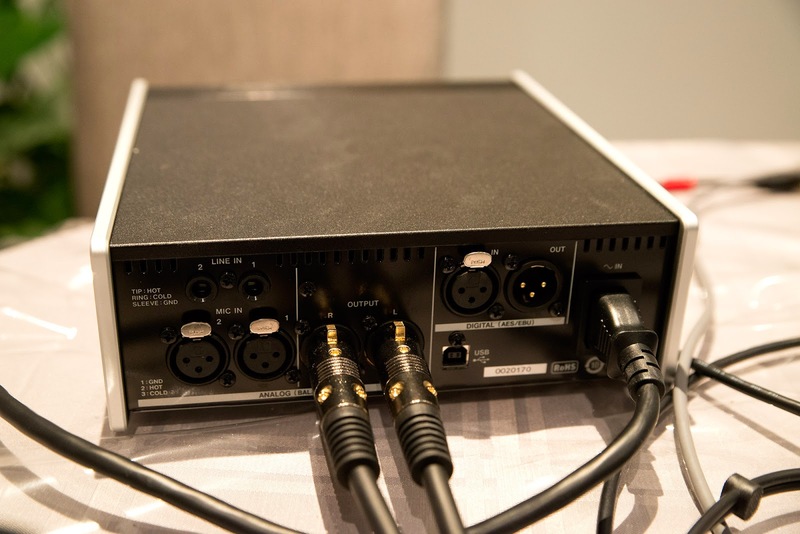 Analogue output is via balanced XLR connectors, and to the right we have XLR digital (S/PDIF or AES/EBU) in and outs, a USB 2.0 port below, and of course IEC connector for power cable. Human passion is an interesting phenomenon isn't it? With it, we as individuals can strive to achieve in ways we look back on and marvel. Passion drives creative pursuits like symphonic compositions or visual masterpieces. Prosocial acts of compassion and love flow from this most mysterious fountain to produce individuals of such distinction that we cannot help but show reverence. Scientific achievements likewise require the passion to fuel the drive for understanding whether in creative ways (consider Einstein's "thought experiments" resulting in the theory of relativity), or the power to endure and overcome the monotony of experimentation (how many prototype light bulbs did Edison make?). As a community, a common passion provides the glue that bind us together. A sense of vision; of purpose. Consider the joys of a close-knit family, teamwork (hopefully!) at one's place of employment, or the excitement fuelling the rise of one's favourite sports team, or the pride of one's nation in the Olympic Games. Passion also ties us together in less grandiose ways of course... For whatever reason, the fact that you're reading this post probably means you have an affinity to audio of some form. Perhaps you're an avid album collector revelling in the ownership and experience of music, or maybe passionate about the hardware side; the fascination with the equipment itself which can enhance the joy of music. Given that I have put together many articles on this blog on the hardware, I must count myself also in some way as part of the "hardware" subculture of audio. As much as human passion (and emotion in general) can be positive, we must be careful of the converse effect. Consider notorious individual "crimes of passion", terrorist groups, racial acts of hatred, or destructive cults and religions throughout world history. Again, these are the extremes, but they highlight the dangers inherent in individuals or groups when emotions rule, but rational thought, and reality-testing become suppressed. The folks on the Squeezebox Audiophile Forum bring up interesting articles on the web every once awhile. Recently, there's this discussion about this ethernet cables and jitter article. On the surface the author makes a case for timing being inherently important in audio. Sure, that's true. But of course, for anyone who understands the asynchronous nature of ethernet data communications and how jitter originates in the DAC and can manifest in the analogue output, it's quite clear that the simplistic explanations presented just makes no sense. Yet in the "hardware audiophile" subculture, it's somehow encouraged to accept magical thinking such as this about needing "better" ethernet cables and those who are bold enough to state the facts are often painted as "closed minded" or those unable to hear the reported subjective difference are branded as having "cloth ears" or accused of not using equipment of adequate resolution (or adequate price?). Of course, audiophiles of this variety discount objective analysis that "captures" and measures the sound and refuse to acknowledge methodology which would remove subjective biases as if they are immune to well described psychological phenomena (eg. banning discussion on ABX or blind testing in some forums). When a group of people gather together with a common passion, share ideas initially based on some semblance of fact but in time builds and are fuelled by purely subjective testimony, and ultimately discounts divergent opinions (confirmation bias), what we end up with is a subculture based on faith. It's quite evident that this is what has become of discussion around high fidelity audio reproduction in many parts of the Internet and in the print magazines in general. Where there is faith, fought with vigour, breeds a form of religion. Since time immemorial, money and religion have always been intertwined. The sale of items of faith has always been a high margin proposition (consider the sale of indulgences). As a business, audiophile equipment is of course about the profit motive. However for years now, claims have been made about various dubious hardware (particularly tweaks, cables, "room treatments") and in recent years software (like OS optimizers and playback software) based on articles of faith without any evidence whether directly (see p. 128 in the January 2015 issue of Stereophile for a contemporary example) or indirectly through published articles in the audio "press". The question of journalistic ethics is certainly questionable with a number of websites where financial supports remain undisclosed. Complicit in this is the audiophile mainstream media's apparent lack of courage and conviction to take a stand to question or test these claims in any reasonable manner as to whether these items make any discernible difference. I can only presume with the loss of subscription income, magazines probably are at a point where they are at the mercy of advertising dollars to survive (in this regard, we can't blame them I suppose since "biting the hand that feeds" them will lead to their own demise). But without a media willing to engage in critical thinking to sort out faith from science, how then can the typical audiophile be educated? I cannot help but believe that in the face of all of this, independent blogs and message forums become important for critical thinking in this day and age (and not just for audio). Much of what I describe above isn't unique to the audiophile world. Consider homeopathy, alternative health care, or the nutraceutical industry where likely much (or all) of the "effect" is placebo, yet many subscribe to the beliefs wholeheartedly and spend significant dollars as well. At least there are some regulations in that industry and even Dr. Oz got his hands slapped before the Senate earlier this year. Many of these alternative theories can of course be discounted, but medical science still holds many mysteries to be discovered as it develops and secrets of the body are revealed. The thing about audio of course is that this is a mature applied science we're talking about (especially digital computer audio), not discovering some new frontier in genetics for example! We could argue about audibility of things like 16/44 vs. 24/96 knowing that maybe 16/44 is cutting too close or that there could be filtering issues with some DACs around the Nyquist frequency. But there are other things like ethernet cables where there really is nothing to argue about by virtue of what it is and what it was engineered to do! All of that stuff about timing and jitter (referring to the article above) are just not possible "issues" between otherwise error-free ethernet cables. A belief or "faith" that it is possible constitutes some kind of magical thinking which when systematized (as the Industry might want to do to instill fear and uncertainty) adds to the overall audiophile myth. 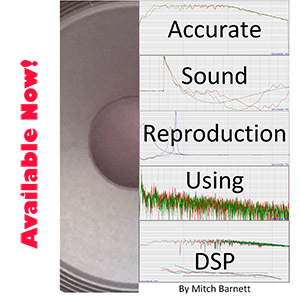 Not some new frontier for science to explore, but certainly more ground for manufacturers to create revenue from the unsuspecting audiophile told to expect an upgrade in sound and cheer-led by the press. Okay, finally it's time to put up the test results for the "LP Needle Drop Blind Test"! A big thank-you to those who spent the time to listen to the 3 vinyl rips and then entered your results in the survey site I put up! As described previously, the purpose of this blind test was to ascertain the preference of respondents listening to a high-resolution rip of Paul Simon's "Diamonds On The Soles Of Her Shoes" from the same Graceland album (2012 25th Anniversary Edition - RTI 180gm remaster - Matrix / Runout (Side A): 88691914721-A RE1 20315.1(3) STERLING RKS). The samples were all ripped with the same ADC (my Creative E-MU 0404USB) and laptop (Acer Aspire 5552-7858) using Audacity 2.0.5 at 24/96 bitdepth/samplerate. The raw audio files were edited with Adobe Audition 3 for equivalent fade-ins and fade-outs, and average volume was normalized across the three samples (alas resulting in a few clipped samples which I do not affect the final "gestalt" of the sound). I felt that a 2 minute sample was adequate for evaluation of sound quality. Instantaneous A/B testing with something like the foobar ABX Comparator was encouraged. A significantly more expensive turntable system consisting of the Roksan TMS, SME309 tonearm, Ortofon Cadenza Black moving coil cartridge and Whest PhonoStage.20 preamp was compared with my own modestly priced stock Technics SL-1200 M3D turntable with either a Denon DL-110 (high output moving coil) or Shure M97xE (moving magnet) cartridge fed to an Emotiva XSP-1 preamp with phono input. In total, I received 39 responses to this test. I know that my FTP site uploaded >150 copies of the audio test file so I suspect many more people must have listened than took the time to respond. There was also an alternate download site so I suspect much more than 150 people downloaded the samples. Compared to previous tests with survey result of >100 responses, 39 results is relatively small but realize that this is still larger than most informal surveys I have seen done on audiophile forums. Also, compared to previous surveys, this one wasn't advertised to nearly as many places. Vinyl rips are a little odd, "straddling" both computer audio in that they're often ripped at high-resolution (24/96 in this case) so ideally the tester has high-res digital playback gear, but the actual sonic differences are mainly due to the analogue hardware and would likely only interest those who know about turntables and cartridges. Needless to say, despite the growth in LPs, the LP format remains a niche market (8.3 million LPs in all of 2014 for the U.S. isn't bad, but remember, weekly CD sales is on the order of 4-5 million units but dropping). I announced the test only on the Audio Hardware forum on Steve Hoffman Music Forums, the Squeezebox Audiophile forum, the Vinyl forum on Audio Asylum, and the Vinyl Circle at AudioCircle. 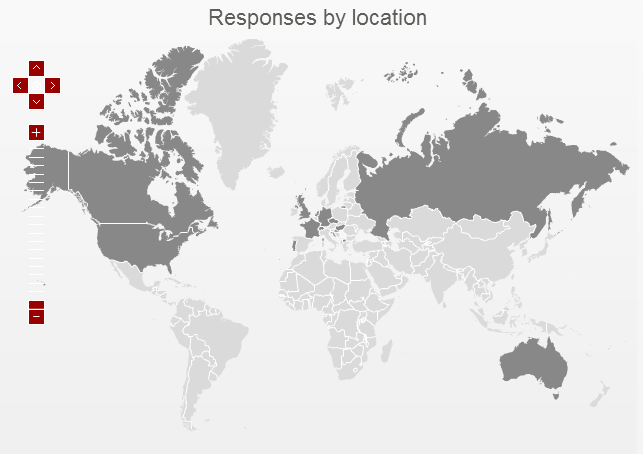 Interestingly the majority of survey responses came from Europe - ~54%. Followed by North America with 33%. In the survey, I asked respondents to rate which of the 3 files they liked the MOST, the SECOND, and finally LEAST. As you can see Sample A marginally edged out Sample B as the "best" sounding file by only 1 vote. However, if we include results for what was "second best", clearly Sample A beat out B and C as preferred. Consistently, Sample C was considered least well liked. 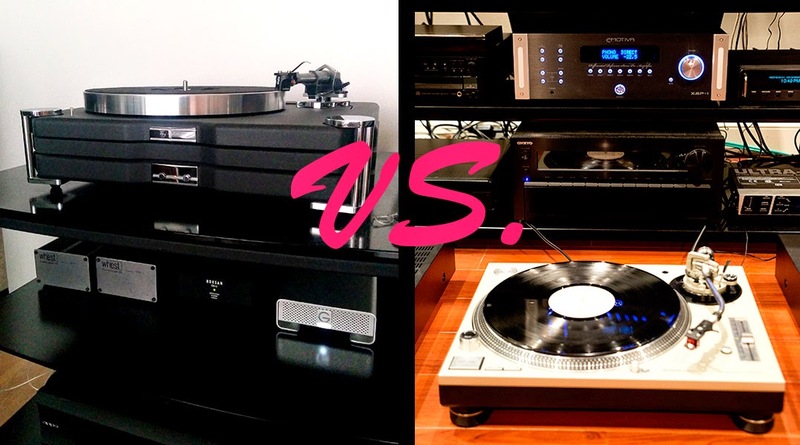 Overall, it looks like the Technics SL-1200 and Denon combo connected to the Emotiva XSP-1 preamp was the "winner" in this survey! Not by a huge margin of course. 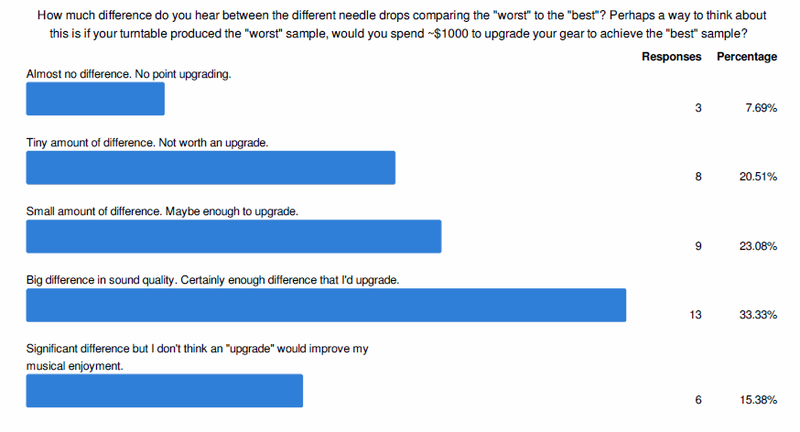 In total, about 1/3 of respondents thought the difference was worth the upgrade versus a combined 51% thinking there's probably not enough of a difference to consider a $1000 upgrade (of course the price difference between the TMS system and the Technics is much larger!). Interesting to see that 15% basically found that the difference was significant but would not change their level of musical enjoyment if upgraded. Again, we're seeing a similar pattern to the results of the full sample; that overall Sample A (Technics SL-1200 M3D + Denon DL-110 cartridge) was preferred and the same turntable with the Shure M97xE was least preferred. There was no evidence of any special preference with the group that heard a greater difference. Like with my other tests, I asked the respondents to identify the digital gear used to listen to these samples. Also like before, clearly most audiophiles who took this test used very good equipment to listen with. DACs used included the Schiit Modi, Naim DAC-V1, Meridian Explorer, ATOLL DAC 200, M-Audio Delta 410, iFi Micro iDSD, FiiO X3, Benchmark DAC2, Mackie Onyx Blackjack, Simaudio Moon 100D. Only about 4 respondents reported using the built-in computer motherboard DAC. About 50% of respondents identified themselves as using headphones for the evaluation. Headphones identified included many using Sennheiser models (HD800, HD650, HD600, HD280, HD580, HD428), Sony MDR-7520, HiFiMan HE-500, Audeze LCD-2 rev2, AKG K530, AKG K612 Pro, AKG K701, Denon AH-D2000, AudioTechnica ATH-M50x, Grado SR80. Speaker systems included Monitor Audio RX8, Linn Isobarik, B&W 805, Rega RS5, Klipsch Heresy, Dynaudio Contour S3.4, Devialet 200 + B&W 802D system, Meridian active speakers, Mission 702e. 18% reported using foobar ABX Comparator or equivalent. Well, I did say this is for fun, right? But I think there are a few general facts to keep in mind when talking about vinyl drops in general and specifically analogue gear. 1. I believe a well recorded LP needle drop (especially at high resolution) does represent the actual sound produced by the turntable/cartridge/preamp - essentially 100%. I tested this by recording the track at 24/96 (with the old E-MU 0404USB) and volume matched with the turntable playing back the song in realtime, switching between inputs resulted in indistinguishable sound at least for me (and my wife was willing to lend her ears); as in all subjective experiences YMMV. Of course, it's important to make sure you play the digital files back with an accurate digital front end. As a result, I believe one can evaluate the sonic differences quite easily - audibly obvious compared to say high bitrate MP3 vs. lossless or the difference between 16/44 and high resolution digital. for example, a friend sent me his rip of this same track using the Audio-Technica AT150MLx and the high frequency boost from that cartridge was easily heard. 2. A number of people commented they did not like the sound of vinyl rips in general compared to the CD rip. I can totally understand, especially since so many respondents used headphones for evaluation. Vinyl rips, especially when completely untouched like the samples in this test do contain the imperfections of vinyl playback. Surface noise is heard during quiet segments and the occasional crackle and pop will be heard from dust, static, or vinyl defects. I have seen people post on forums that they've never experienced surface noise and never heard a pop - that's just nonsense. It's not uncommon to find new LPs with noisy background even after thorough cleaning and many of my records from the oil crisis days of the early to mid-1970s clearly were made with noisy, probably recycled vinyl. (Interestingly, most of my 1980's LPs sound great even though they may appear thin on inspection.) Over the years I have checked out some beautifully recorded vinyl rips rivalling the quality of professionally produced remasters; there's a real skill and art in restoring the sound especially for music that was dynamically squashed in the CD/digital release. 3. I think this is a nice demonstration of how important the choice of a good cartridge is! Notice that the "best" overall sample was the Technics turntable with Denon DL-110 cartridge. And the "worst" sample was the Technics turntable with Shure M97xE. The only difference being the different cartridges. Nice to know that the more expensive Denon in this case was felt to be superior on the whole (at about 3x the price). The main complaint about the Shure was that it accentuated the sibilance in Paul Simon's vocals (like in the word "she"). Even so, 20.5% of respondents thought the Shure sample sounded best so there's obviously significant subjective variation. 4. BUT a much more expensive system like the TMS turntable + SME tonearm + Whest phono preamp did not draw higher preference overall from the respondents. It goes without saying that there is always a point of diminishing return with mature technologies and it's no surprise that price itself is not necessarily a determinant for best sound quality. I have already previously posted on wow & flutter measurements for both the Roksan TMS and Technics SL-1200 M3D demonstrating that the Technics is actually more accurate in terms of absolute speed. A few respondents and chatter on the Steve Hoffman Forum noted that Sample B (TMS system) had an audible hum in the silent portion. This is true and can be heard at 57 seconds at the end of the Ladysmith Black Mambazo segment as it transitions to the Paul Simon vocals. This is much more obvious with closed headphones or a quiet sound room with low ambient noise. It's obvious that not everyone heard this anomaly though. I've gone back to my friend's place and confirmed that it's coming from the Whest phono stage (rather than the TMS turntable or phono cable). It serves as a good reminder of the importance of sensitivity to noise of an analogue setup. Remember that the Ortofon Cadenza Black is a low output voltage (0.33mV) moving coil cartridge (vs. 1.6mV Denon vs. 4mV Shure). This means there's greater amplification applied by the phono preamp and a concomitant increased risk of picking up hum in the system. The quality of the phono amplification stage therefore becomes extremely important. I cannot tell if this hum is unique to my friend's Whest unit (which is a number of years old at this point). For the record, vibration isolation isn't really an issue in this case because I was recording the needle drops without the speakers playing the music and the room was basically silent during LP playback. Hope you're all enjoying the music as we head into the Holiday Season... Thanks again for all the respondents; I obviously wouldn't be able to do any of these blind tests / surveys without your time and participation! Last night I went to watch the movie Interstellar at the local megaplex. Wow! Neat movie; reminds me of 2001: A Space Odyssey with all kinds of sci-fi ideas - AI (robots with humor! ), evolution of humanity, almost "divine" guidance, centrifugal artificial gravity and cryosleep. Elements of modern science gets thrown in: black holes, wormholes, Grand Unified Theory, space-time relativity, and genetics. Of course we must throw in the human elements: love, family, relationship, fear, loneliness, perhaps even madness. Highly recommended flick and one I'll be looking forward to on Blu-Ray. E-Mail: "Full Dynamic Range" - Now there's a marketing phrase to get behind! I think this is funny. A contradiction in every way imaginable which is why I wanted to share it with you. I know it’s not your type of music and although I still listen to it sometimes, it’s mostly youth sentiment for me. One of the loudest and fastest bands back in the days was Terrorizer. Their drummer (Pete Sandoval) is one of the fastest drummers I have heard, he's amazing. But unfortunately production for this kind of music wasn't always very good. It's often compressed to hell and equalized with typical "rock" settings; increased lows and highs and suppressed mids. It's often overdone in my opinion. I do think production of hard rock and metal albums have improved over the years but back then, some were just downright bad. This particular album wasn't that bad though, it was actually pretty decent from what I remember. Terrorizer was a so-called super band. Some of the best musicians from different bands came together to produce one album. The band split up that same year but after 2005 they came together a few more times to release other albums. This album was their debut from 1989, titled World Downfall. It is considered one of the most influential albums in the genre and now a classic that every fan of the genre should own. 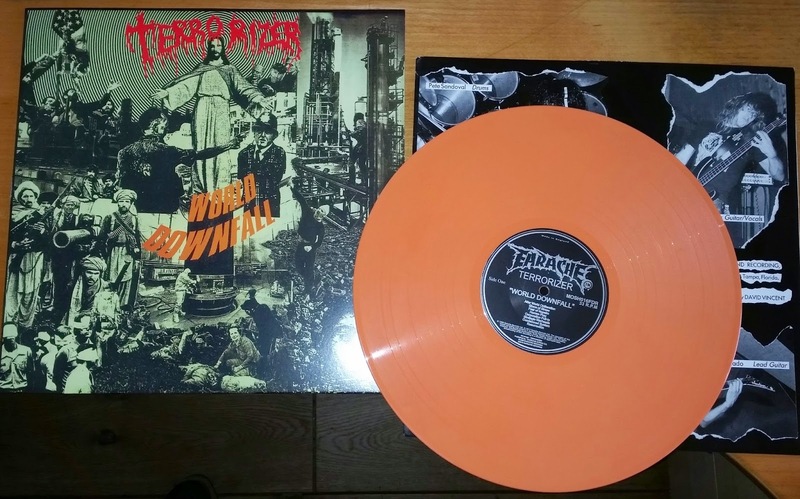 I ordered this album on vinyl recently, limited to 100 copies, in "Downfall Orange". What struck me was that it is marketed as a "Full Dynamic Range" version. I would never have ordered it if that wasn't mentioned! Could this be the new marketing phrase? The end of the loudness wars? How much dynamic range can be in music like this? And how good can it really sound? I was curious and I could not resist the urge so I bought it ... :). Fitting label too, Earache! Haha! The average album DR is 12. I think that's amazing! The album sounds spatial, black background, there's air around the instruments and the drums sound natural. Basically, the album just sounds very good. Obviously the entire album is one massive wall of noise so I can't say it’s not tiring to listen to but at least now it’s a good sounding wall of noise haha! :D.
I am surprised that the end of the loudness wars (if that ever happens) would see a start with albums like this. But if this is it, it definitely looks promising! Funny story about the drummer, the band once played a prank on him by making him listen to a band that used a pre-programmed drum machine, and pretended it was a real drummer who could play faster than he could. He was gutted, and went on to practice until he managed to play faster than the machine. PS. I don't advise you listen to the album. If you decide to do so you it's at your own risk. I'm not liable for any damage this might cause, physically or mentally! Haha! Just kidding! You’ll live J. As I noted in this previous article, I actually think that the next round of remastering will actually swing the pendulum towards "full dynamic range" to differentiate the sound from current loud dynamically overcompressed releases. 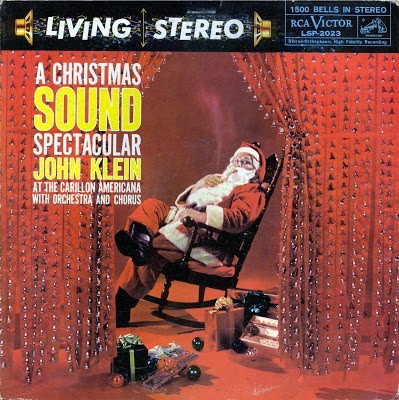 A movement of this sort would be a true advancement of sound quality that would make the push towards "High-Resolution Audio" and format wars like PCM vs. DSD (yawn...) audibly irrelevant in relative significance. Remember, we should be cautious about reading too much into DR values of vinyl rips and comparing directly to a CD version, of course. However, also remember that vinyl is limited in how much compression can be applied in order to prevent tracking issues. I wonder in fact if this limitation may be an important reason why LPs have survived - they can sound better than the corresponding CD because the masters used to cut the vinyl have always needed to be of a decent dynamic range. Although the track is loud; visibly so zoomed out like this, I'm sure zooming into the waveform would reveal zero clipping / peak limiting which is what kills the DR value. In other news: we just saw the release of Bruce Springsteen's Born In The U.S.A. available on HDTracks at 24/96 with a DR of 9. Original first CD release in the 80's - DR13. Born To Run is even worse with DR8 (I think even the 30th Anniversary CD release may be better). Hey Columbia Records, you do realize a little bit more audio realism can be squeezed out from 24-bits, right (which I hope is what audiophiles are looking for in these "better than CD" releases)? As usual, I highly recommend checking out the Dynamic Range Database to get a sense of the mastering quality before jumping into these so-called "high-resolution" albums. Thanks to everyone for trying out the "LP Needle Drop Blind Test", especially those who took the time to submit survey results. The survey site is closed although the FTP remains open for now. I'll likely close that off this weekend.